Dude. Would you be planning an update to that pretty long list of yours? 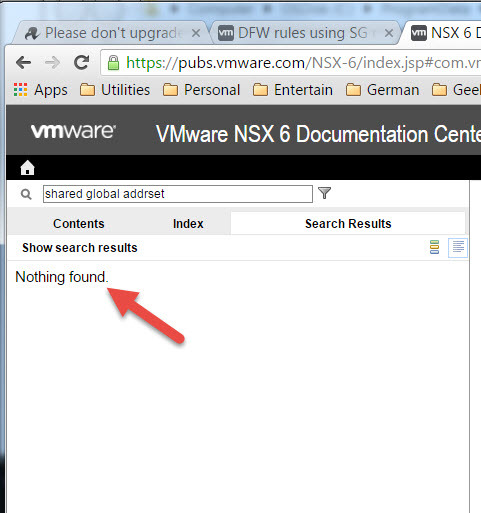 This post has been a constant go-to of mine as a reality check against my NSX-fanboi-ism. Your detailed insights in this post are just great. But I would really really love it if you could do an updated version. A lot of little details have changed and NSX is moving more towards layer-7 now also. However, I think the overall point that its still hard to manage, aka, all ‘day-two’ types of work, is still very valid in regards to NSX. Thank you for the comment. Sorry for the ‘scribbled notes’, I never had a chance to sanity check and clean up. I no longer work on the project so cannot update it. Hopefully NSX will incorporate more of the enterprise features found in CheckPoint and Palo Alto, combined with the positive aspects of NSX and make a true enterprise product.